The overrunning of Serbia by Central Powers forces (in­cluding Bulgarians), the evacuation of Gallipoli and the siege of Kut in Mesopotamia blighted many of the pet schemes of the ‘Easterners’. Once again, Allied plans for ‘decisive offensives’ on the Western Front received top priority. Massive Anglo-French combined operations were scheduled for spring 1916. 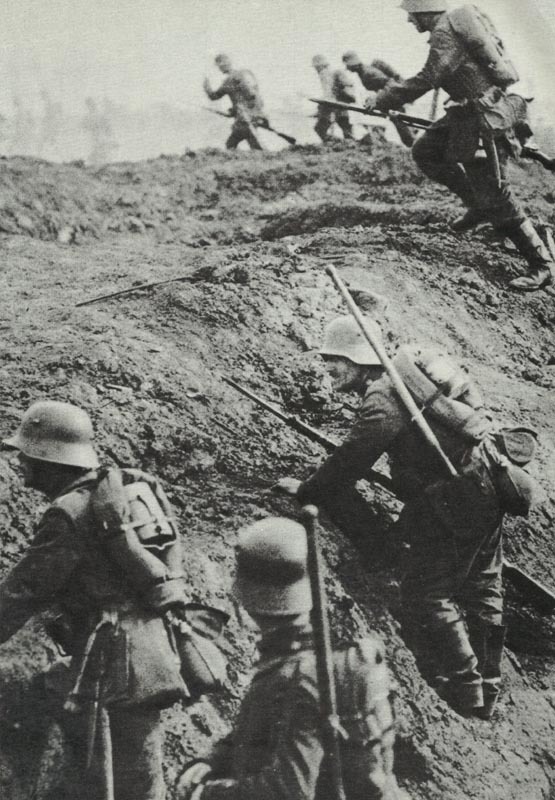 But Falkenhayn struck first at Verdun on a quiet sector of the front. The war’s longest battle began on 21 February and lasted until December. The German preliminary bombardment was the heaviest yet seen in war. The most sanguinary fighting took place for possession of Forts Douaumont (February) and Vaux (June); at Hill 30; and on a hill called Le Mort Homme (‘Dead Man’s Hill’). Douaumont was levelled to the ground and the very earth around it reduced to the consistency of fine talcum powder. The defenders were led by General (later Marshal) Philippe Petain, under the watchwords Ils ne passeront pas ! (They shall not pass!). And they did not pass ! A round-the-clock, week-in week-out shuttle service of motor trucks kept the garrison constantly supplied. The prolongation and ferocity of the fighting soon bore little or no relation to the intrinsic importance of the German objective; 66 French and 42 German divisions were deci­mated. The German Chief of Staff, Falkenhayn, intended to ‘bleed the French Army white’. If the successful French counterattacks of August-September 1917 are included, casualties at Verdun totalled a round million (550,000 French, 450,000 German). The Allied reply to the Verdun onslaught came in the Somme valley during July-November. But Haig’s unimagi­native frontal attacks and the lamentable performance of the British artillery (despite adequate supplies of shells) brought no decisive result for the toll of 420,000 British and 195,000 French casualties during the Battle of the Somme. The battlefield debut of the tank (15 September) was on too small a scale to affect it. Dis­agreements over the Western Front stalemate and the fall of Rumania helped bring down the Asquith Government; David Lloyd George was appointed Prime Minister by King George V in December 1916. 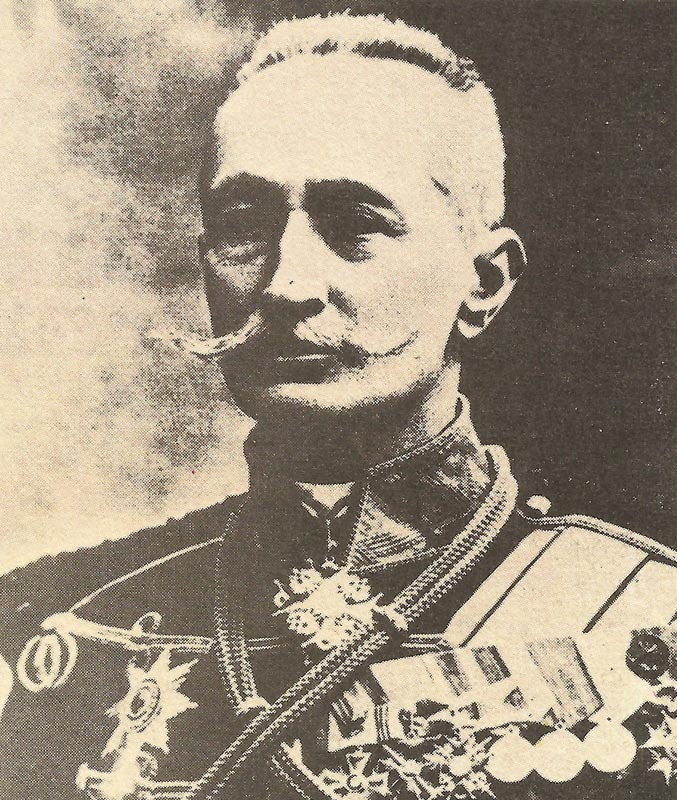 Russian General Alexey Brusilov. He later claimed that if his fantastically successful offensive had been properly exploited, Russia could have won the war for the Allies. Even if he had not won the war he probably prevented the Allies losing it. On the Eastern Front the now better-equipped and trained Russians under Brusilov had already launched the surprise Brusilov offensive that, in June, made spectacular gains between the Pripet marshes and the Carpathians. Between 4 June and 15 August 1916, the Austro-Germans suffered 700,000 casualties (including 360,000 PoWs); Russian losses stood at 550,000. In near-desperation, the Central Powers were forced to transfer no fewer than 44 divisions from all fronts to meet Brusilov’s deadly threat. But Rumania’s entry into the war at the end of August, and the disasters which soon befell the cocksure Rumanians’ really brought Brusilov’s offensive to an end, by radically changing his mission, from the destruc­tion of the Austro-Hungarian armies to the preservation of Rumania, about a quarter of the Russian army had been drawn into the task of preventing a total Rumanian col­lapse. It was an ignominious end to an undertaking that had promised so well. By the end of the offensive, Brusi­lov’s armies had lost 1,412,000 men. Brusilov’s offensive was the last flourish of Imperial Russia. The British force besieged at Kut in Mesopotamia, had to surrender to the Turks in April 1916 (the largest such capitulation since Kabul in 1842). But this was the Ottomans’ only success. Late in the previous winter (February 1916), the Russians under Yudenich had captured the strongly fortified city of Erzerum in Turkish Armenia. A second Turkish attack on the Suez Canal failed in August, while the Arab Sherif of Mecca pro­claimed a revolt and received the assistance of a British mission, which included the extraordinary Captain T E Lawrence. Lawrence helped organize the Arab army and, during 1916-18, gave invaluable assistance to the British forces in Palestine by forming and securing their right flank. In East Africa, a prolonged British and Belgian offensive directed by Smuts overran most of Germany’s last colony but at heavy cost from disease and without ever decisively defeating Lettow-Vorbeck’s resilient defenders. 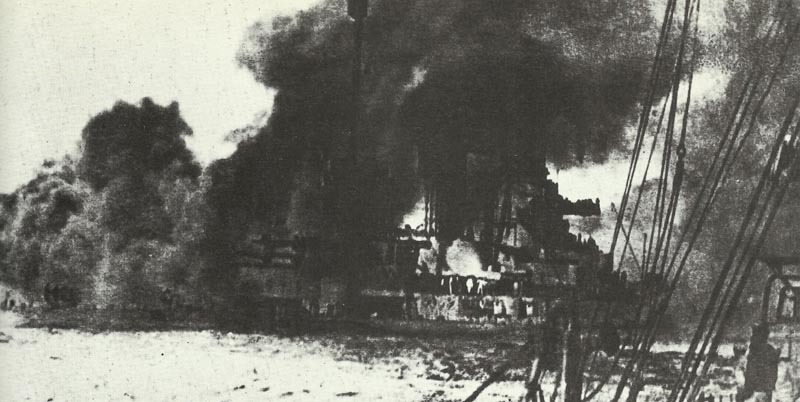 The German battle-cruiser Seydlitz on fire during the Battle of Jutland. Although she was heavily damaged by a torpedo and by shellfire, she was not put out of action. Germany had begun unrestricted submarine warfare in February 1915, but repeated American protests since the sinking of the liner Lusitania and other atrocities forced Berlin to suspend the campaign in April 1916. When Scheer, new commander of the German High Seas Fleet, attempted to repeat the bombardment of English coastal towns earlier carried out by his predecessor, he provoked the one and only general fleet action of the war – Battle of Jutland, or Skagerak as the Germans called it. British losses were heavier but the German fleet never ventured out again with serious intent. In an attempt to force the British to their knees, the all-out U-boat campaign was resumed in February 1917. The venerable Austrian emperor, Francis Joseph II, died on 21 November 1916, aged 86. He was succeeded by his grand-nephew, the Archduke Charles. Although not previously suspected of having any interest in or aptitude for anything beyond soldiering and devotion to his glamor­ous wife Zita and infant son, Charles was soon making earnest endeavours to save his gravely threatened inheri­tance and conclude peace. Renewing his efforts the follow­ing spring, he employed his brother-in-law, Prince Sixtus of Bourbon-Parma, to act as intermediary between the Aus­trian and French governments. However, neither this initiative nor a ‘peace note’ from Pope Benedict XV (August 1917) bore fruit. Other (less august) ‘peacemakers’ were the British peer, Lord Lansdowne, the German Baron von der Lancken and millionaire American industrialist Henry Ford.